Coverage: Live on BBC Radio Wales, BBC Radio Cymru and online. Gareth Bale has been named in the Wales squad for the Euro 2016 qualifiers against Bosnia-Herzegovina and Andorra later this month. The 26-year-old forward has missed Real Madrid's last three games with a calf injury but is set to return for the La Liga derby against Atletico on Sunday. Chris Coleman's team need one point to qualify for the finals in France. 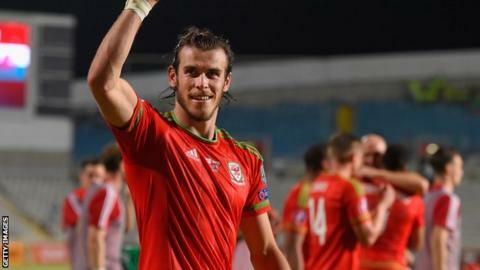 Wales face Bosnia in Zenica on Saturday, 10 October and host Andorra in Cardiff on the following Tuesday. Coleman said the medical feedback from Real Madrid on Bale had been ''all positive." The Wales manager made it clear he will not be tempted to hold back 52-times capped Bale for the home match against minnows Andorra, who have yet to score a point in the qualification section. "I don't even think about Andorra, I thinka bout getting a result in Bosnia. To do that w need our strongest team on the pitch and, of course, he is right in the middle of that," Coleman said. Allen returns to the squad after missing September's win in Cyprus and goalless draw at home to Israel with a hamstring injury. Crystal Palace pair Ledley and Jonathan Williams, who is currently on loan at Nottingham Forest, are also back from injury. Wolverhampton Wanderers midfielder David Edwards is included after initially being ruled out of both games with a knee injury. Huws has not featured for Wales since the 0-0 draw against Belgium in Brussels last November because of an ankle injury. Coleman praised the Welsh rugby team for their World Cup win over England at Twickenham and said the Welsh nation were united in their desire to see their sporting competitors do well. Forwards: Hal Robson-Kanu, Simon Church, David Cotterill, Tom Lawrence, Sam Vokes, Gareth Bale.